I am really excited to tell you about my new blogging gig. Rhodes Bake-N-Serv asked me to be one of their guest bloggers on their new blog. Every Wednesday Rhodes will featured a guest blogger. I am among the group of 8 Rhodes guest bloggers. Melissa, Julie, Jonna, Yvonne, Deborah, Erin, Stephanie. 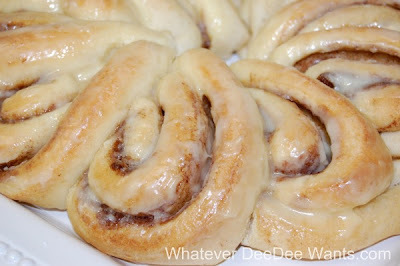 Today I am sharing this yummy cinnamon roll wreath on the Rhodes Bake-N-Serv blog. I hope you will come on over and check it out. In honor of my first Rhodes guest post I will be giving away the newest Rhodes Bake N Serv cookbook to one lucky winner. I want this book too - I use Rhodes all the time. I follow you (on FB & twitter) etc. and do all the other things -but I just don't have the time to post all of them. oooh i love rhodes :) congrats on becoming a guest writer for them! That's awesome! Congrats. That wreath is gorgeous! I am definitely going to try it! Love your blog, love Rhodes and I love the jewelry! The cinnamon rolls look yummy! Follow you on GFC as AnneL. I enjoy cookbooks with ready made products. Hi Dee-Dee! I found your delicious recipe for the cinnamon rolls here on Rhodes newsletter. I also signed up for your newsletter, I will follow you on FaceBook to! You have a really nice blog here! Thanks for your input and all the time you must be putting into it! God Bless! TOL = Tons of Love! My friends and I on FB are trying to make this a world wide greeting!